See the ocean from the front yard! 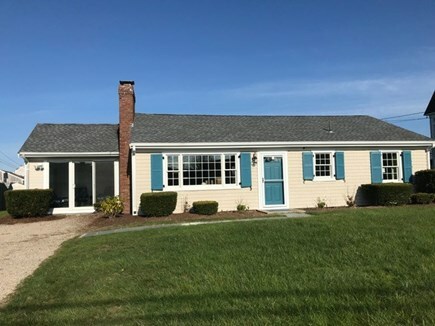 We've spent every summer in Falmouth and couldn't resist buying this house because the amazing location is easily accessible to the beach, Falmouth Village, and the Shining Sea Bike Path. Beautiful Surf Drive Beach is literally a 2 minute walk to the right. You can see and smell the ocean from the front yard. No need to hassle with beach parking permits or full parking lots. 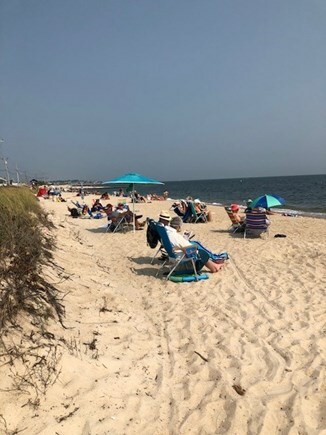 Surf Drive Beach is great for kids with its limited tides and surf due to the protection from Martha's Vineyard across the Sound. At this beach there is a snack bar offering the usual fare plus healthier options like chicken sandwiches and fruit smoothies. Help yourselves to beach chairs and towels from the house. To the left, charming Falmouth Village is a 10 minute walk or quick bike ride. The first place you'll encounter is the legendary Ben and Bill's homemade candy and ice cream shop. In addition to boutiques and candlepin bowling, there is a wide selection of outstanding restaurants including the French bakery, rustic Italian at Osteria La Civetta, premium Tequila selection at Anejo, and the famous Lobster Roll at The Quarterdeck. You'll also find Thai, Indian and Greek restaurant options. 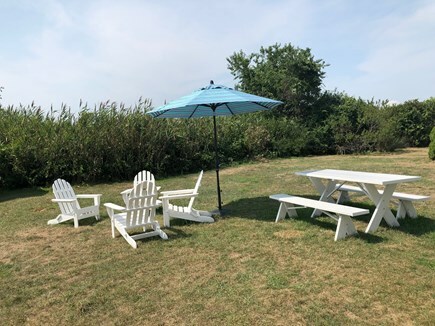 The house also boasts easy access to the Shining Sea Bike Path that stretches from Woods Hole to North Falmouth with spectacular views and many top-notch food and drink options along the way. You can even ride 2-3 miles from the house to catch the Steamship Authority or Island Queen ferry to Martha's Vineyard. Bring your bike aboard and explore the island's beaches and towns by bike. Bike rentals available in Falmouth Village. We recently renovated this 3+ bedroom home with an open dining/kitchen area, an airy sunroom, a den with roomy sectional and flat screen TV, the strongest available Wi-FI, and 2 full bathrooms. The house feels fresh (without that common musty Cape Cod feel). 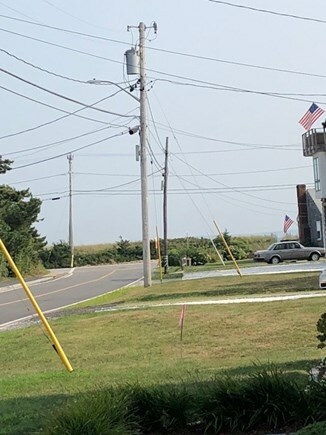 You can see the ocean and Martha's Vineyard from the front yard. The back yard abuts conservation land and has an open, airy, oceanside feeling. The house offers easy one-story living with 3 bedrooms plus a den to comfortably accommodate 8 people. 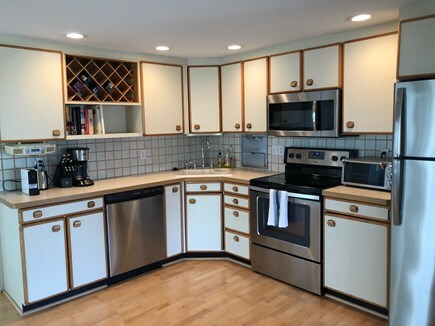 The house has a washer/dryer on the main floor, new kitchen appliances and a second refrigerator. Enjoy meals at the gracious dining room table or in the back yard. 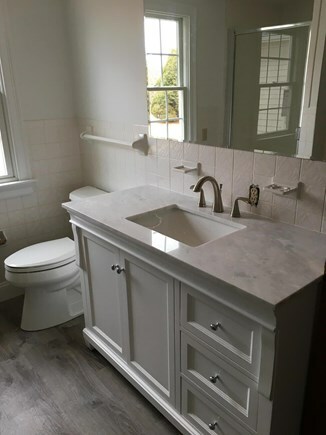 The house has 2 full bathrooms plus an outdoor shower. There is central A/C that is good for taking the edge off on a humid day but given that it's an older system, we don't recommend the house if A/C is top priority for you. The house tends to stay comfortable with ocean breezes and good cross ventilation from the many windows and doors. We recently purchased this home and updated all of the furnishings including all new mattresses and high quality bedding. We seek renters who will be respectful of our home and neighbors. Available for weekly rentals from late June through Labor Day. Two night minimum stay during spring and fall. Additional availability info: Sept / Oct: $300/night or $1500/week; Nov / Dec $200/night or $1000/week; 2 night minimum. Long-Term Rental (1 month or more): Potentially available for long-term winter rental. Please contact us with inquiries. $2000/month. Additional pricing info: $150 cleaning fee. Discount available for multiple weeks. Online payment available. State and local taxes of 12.45% will apply. What a perfect location for a special reunion of old friends. Steps from the beach, leisurely walk into the charming town, access to beautiful biking and walking trails. This comfortable home provided the perfect setting for our weekend gathering. Thank you to our gracious hosts. We hope to make our stay a recurring event! We had a great time and loved this house. Steps from the beach, minutes from downtown, bike path nearby, spacious floor plan and newly renovated. Plus extras: gas grill, bicycles, towels, washer and dryer and a google lock so you don't need to worry about losing the keys. We will be back for years to come. Only 3 minutes from the beach, this quiet house accommodates the needs of all ages from little ones to teens, adults and grannies. A beach side bike path winds 4 miles to Woods Hole. A shady mile-walk to town is fun for shopping, restaurants, ice cream.. A short drive away are shopping centers and movies. House very pleasant. All new beds mattresses and linens. Washer dryer. Great dinner table. Grill. New windows, doors, siding. The spacious back yard abuts a bird sanctuary. Walking distance to good ocean beach and to the charming, New England town of Falmouth. Will try to book as often as possible. Amazing Stay in this Wonderful Home! My family and I stayed here for two weeks in July. We rented the house shortly after it was listed, so there were no reviews yet... Isabel immediately eased my concerns about renting this house - she was incredibly responsive, very detailed in her descriptions, and beyond willing to accommodate our requests pre-arrival (provide a pack play & highchair). Once we arrived at the house, we were beyond thrilled to have all the online descriptions validated. 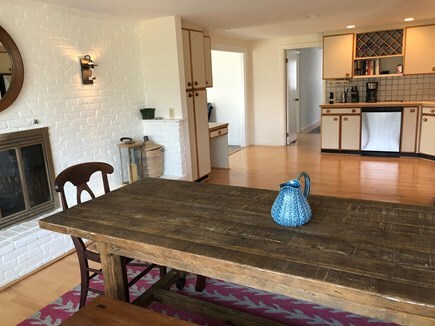 The house is in an incredible location - a few houses away from a beautiful beach, 15-20 minute walk into Falmouth center, and a quick bike ride to the Shining Sea Bike Path. The inside of the house was also beautiful - large kitchen with all the necessary dishes/silverware, a beautiful master bedroom with a new bathroom nearby, and 2 additional bedrooms and a den (that we also used as a bedroom) with a bathroom on the other side of the house. The house was well decorated, really well renovated, and had everything we needed for a perfect beach vacation (including beach towels)! There was also a nice yard, but given the location of the house, we never used it since there was so much to do/see in such close proximity. You can't beat the location! 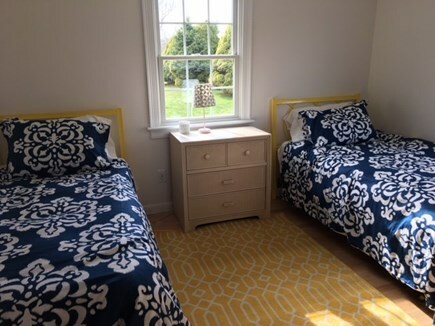 The house is located within a few houses of the beach and about a 10 minute walk to downtown Falmouth and all the restaurants, ice cream shops, etc. We really enjoyed this location. It was great to be able to run home from the beach if we forgot anything, and to walk into town with the family. Tip: My kids loved the playground near the library. The hosts were super responsive. There was no coffeemaker, so we emailed and they had one sent from Amazon arriving the next day! Location, Space, Amenities . . . Oh My! My friends and I rented this home because we were coming to the Cape for our best friend's baby shower and we wanted to stay together, as it was sort of a reunion for us. This property was AWESOME. I believe this is a relatively new listing and that we were the first rental party. the owner was wonderful, flexible, and accommodating. And she made the process so easy (this was actually my first time staying in a rental; I usually stay in hotels because renting a home has always seemed like a hassle for me). Anyway, the home itself was great. From the outside it looks deceptively small and then you get inside and realize how spacious it is! 3 bedrooms, 2 full baths, a den, a sun room, open concept kitchen and living room, and huge backyard. There was plenty of space for all of us and we never felt like we were on top of each other. There was even a shed in the backyard that we could access that had beach chairs and bikes with helmets! Plenty of towels and extra sheets and the home was furnished so nicely. And the location . . . I couldn't believe how close the home was to the beach. it was literally like a 4 minute walk to the beach. When we drove down the street we could see the ocean so closely. And we were also incredibly close to Main Street (maybe like a 15 minute walk). And Main Street has TONS of cute shops, awesome restaurants, bars, etc. You could park your car at this property and never have to drive on your vacation. We've traveled extensively and Falmouth is one of our very favorite places in the world. It combines natural beauty, sophisticated dining and shopping and it is easy to get there. 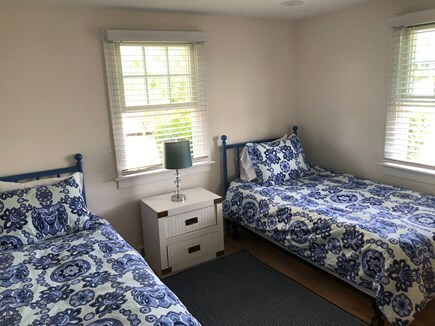 We have rented many vacation homes and have set up our house to offer the vacation experience we seek - an amazing location with clean and comfortable furnishings. We hope you enjoy our house as much as we do! 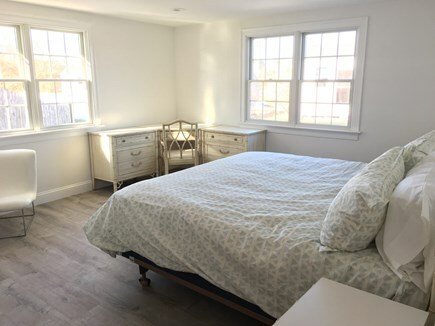 The location of this property cannot be beat - steps to ocean beach and a 10 minute walk (or short bike ride / drive) to charming Falmouth Village. As much as we love the beach, our very favorite thing to do in Falmouth is to walk or ride along the Shining Sea Bike Path which is teeming with gorgeous views and delicious options for a snack, meal or drink. The house itself is well-equipped and so comfortable. Enjoy! 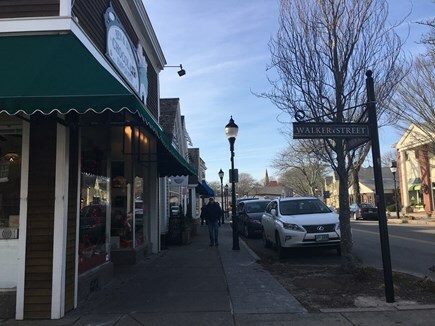 Falmouth offers all the charm of Cape Cod and the Islands yet it is much easier to access than the Lower Cape towns, Martha's Vineyard and Nantucket. The historic Village Green in Falmouth exudes classic New England charm. The restaurants and shops are world-class with a wide variety to suit all tastes. The beaches are gorgeous yet many are difficult to access due to required parking permits and limited parking. Being able to walk to a great beach is key. The jewel of Falmouth is the Shining Sea Bike Path with stretches 10 miles from Woods Hole (where ferries leave for Martha's Vineyard) to North Falmouth passing through Falmouth Village. The views are spectacular and there are many delicious restaurants, coffee and ice cream shops along the way. 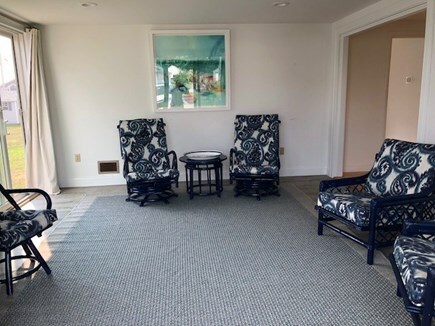 Falmouth also boasts many public golf courses and tennis courts along with a dine-in movie theatre and family arcade with candlepin bowling.